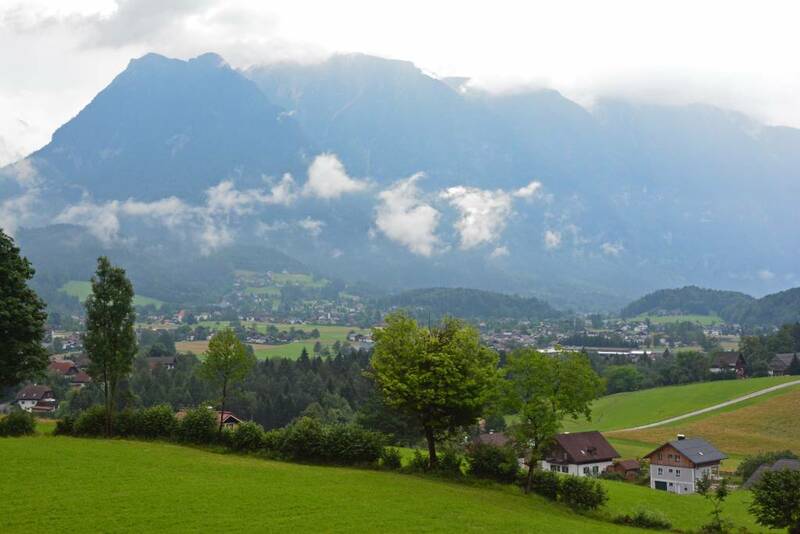 The first day of our hiking holiday in the Salzkammergut Region of Austria began in the sleepy little town of Bad Goisern. 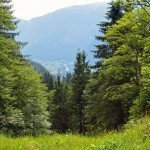 Our journey that day led us on a peaceful walk from Bad Goisern to Hallstatt. Following the correct signs out of town was a little bit of a challenge, as a few of the signs were partially obscured. After wandering around for a bit and finally asking a local, we found our intended path- Soleleitungsweg (also known as the Brine Pipeline), the world’s oldest pipeline, established in 1607. 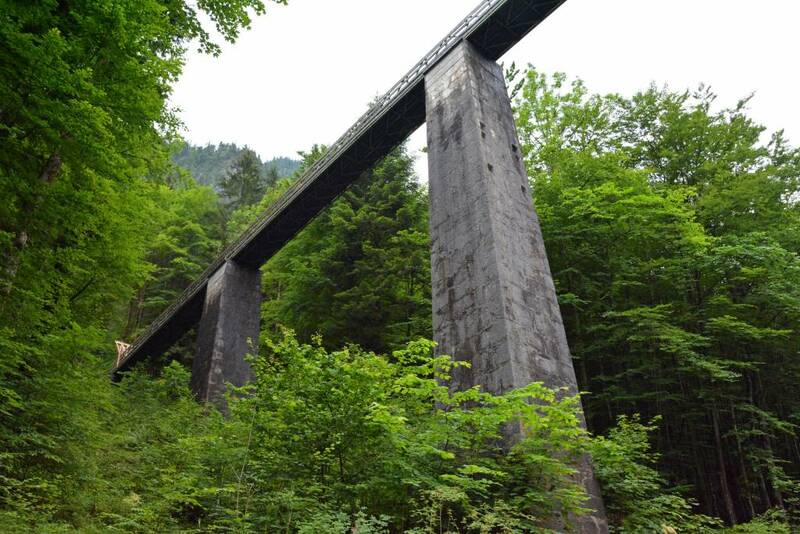 This route follows the tracks of the book smugglers through the Salzkammergut region. In times of the counter-reformation, protestants in Austria had to follow their beliefs in secret. 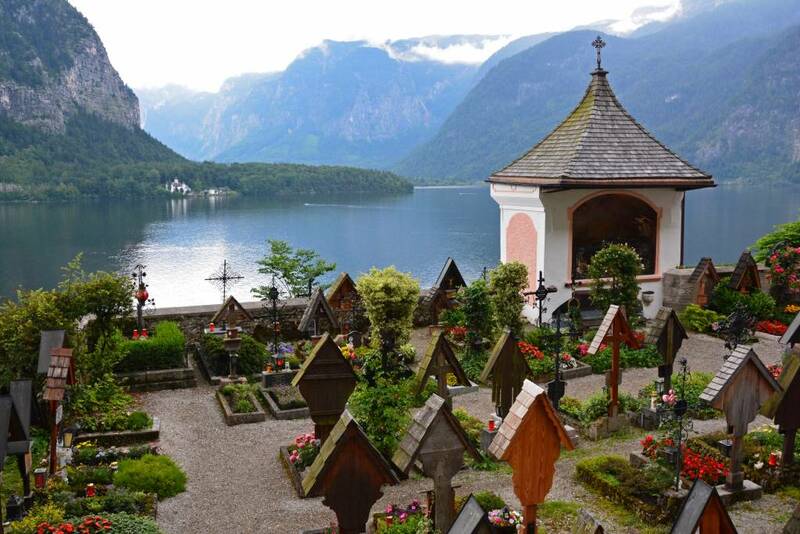 On adventurous routes, under the constant threat of capture (and subsequently heavy punishment), bibles, prayer- and song books were smuggled to the remote mountain valleys of the Salzkammergut where the protestant beliefs were still strong among the population. 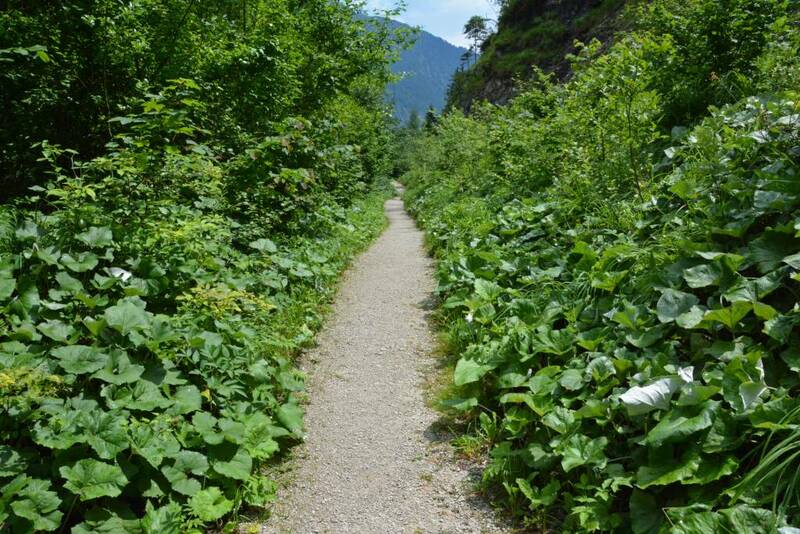 The trail was clearly marked along the way. 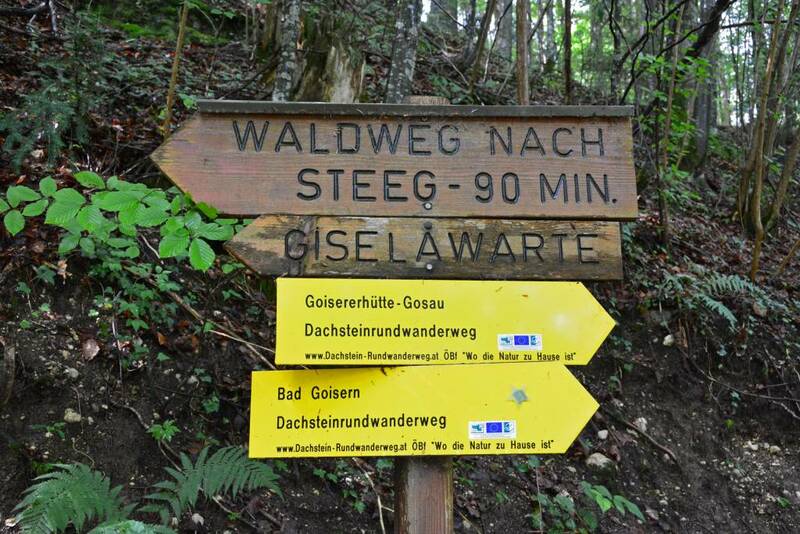 Once we were on the right path, it wasn’t hard to follow the trail from Bad Goisern to Hallstatt as we had a trusty map marking our journey. 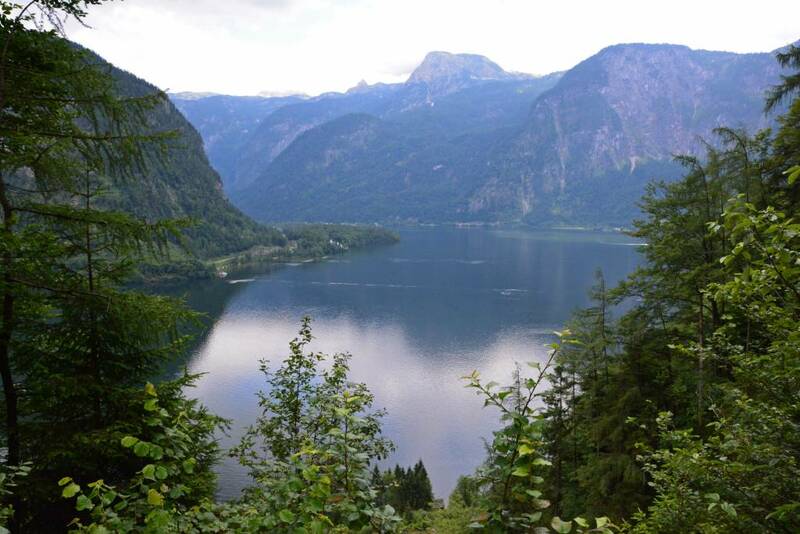 Our first major landmark was the town of Steeg between Bad Goisern and Hallstatt. As a part of the hiking holiday, we were provided with a snack voucher at a local restaurant along the trail, so we eagerly counted down the estimated minutes to our next destination. 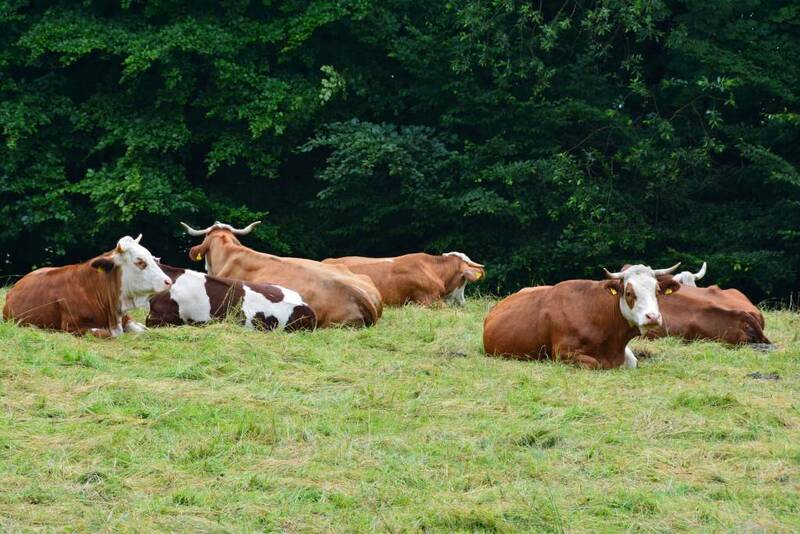 We didn’t pass too many other hikers throughout the day, but we did come upon a few locals during our journey. 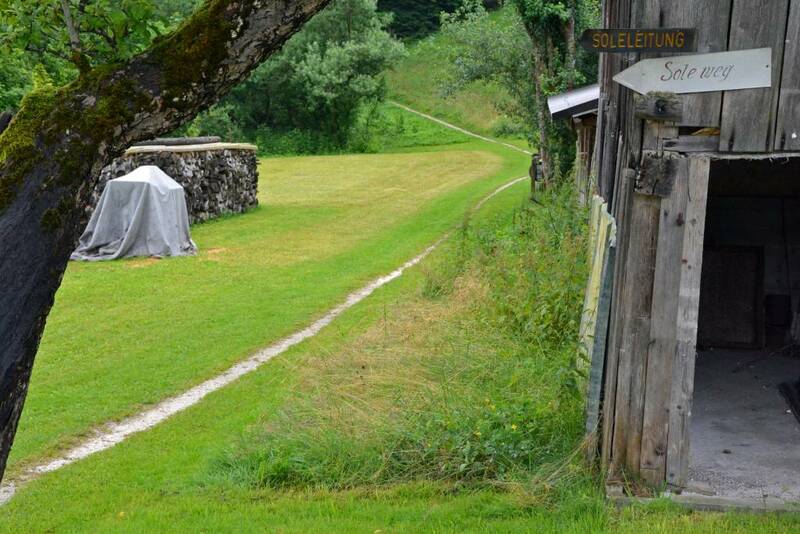 The trail was extremely well-maintained and led through some of Austria’s most luscious landscapes. Sometimes we’d be walking with nothing but trees on each side and every now and again, it would open up to showcase incredible panoramic views! 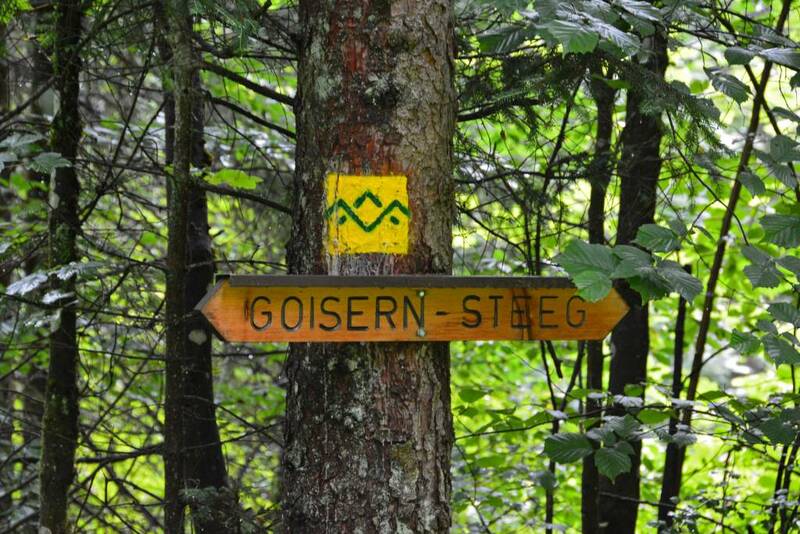 The trail was marked very clearly with a distinctive icon: three green overlapping mountains on a yellow background. It was always reassuring to see these, as it reminded you that you were heading in the right direction. Before we left, Sam downloaded an app for his iPhone called Google Translate. 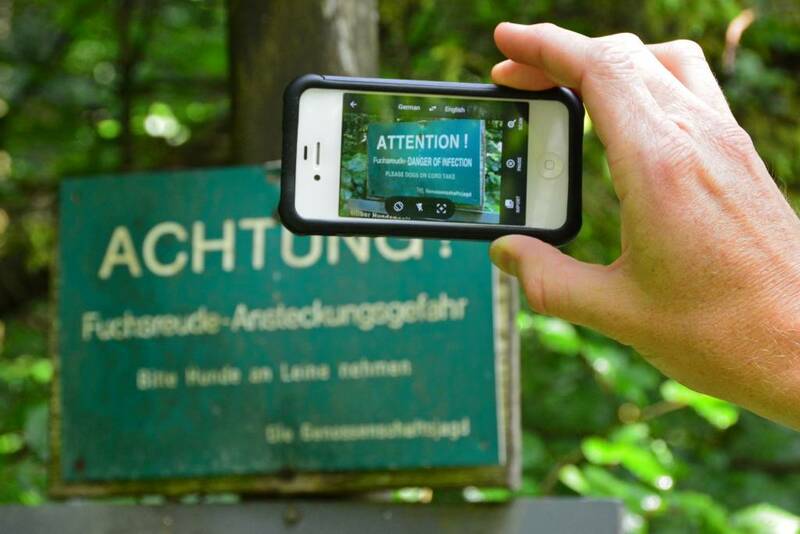 While you need to be connected to the internet to use the word translation tool (which is a life-saver), there is a super-cool function that will attempt to translate written text using the camera on your phone! At the moment, it only works with several languages. Fortunately, German was one of them! The scenery along the way never disappointed. 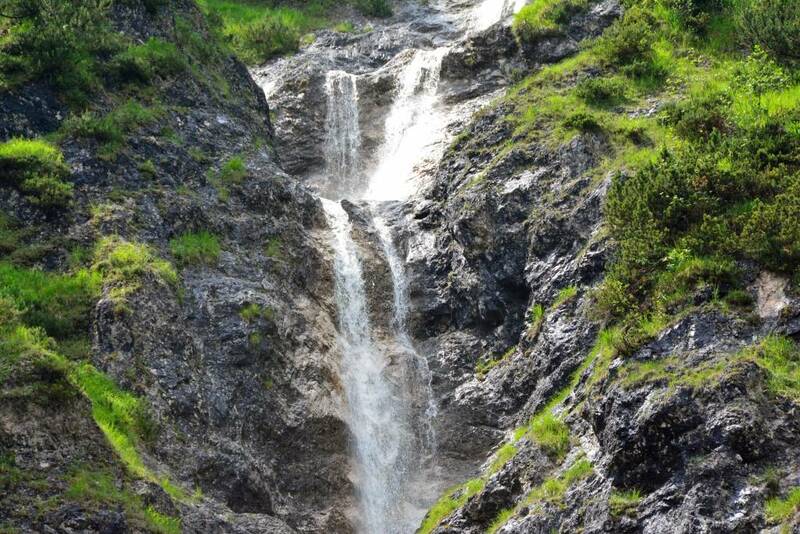 There were forests, meadows, mountains, hills, villages, and beautiful waterfalls. Power is a necessity, no doubt about it. 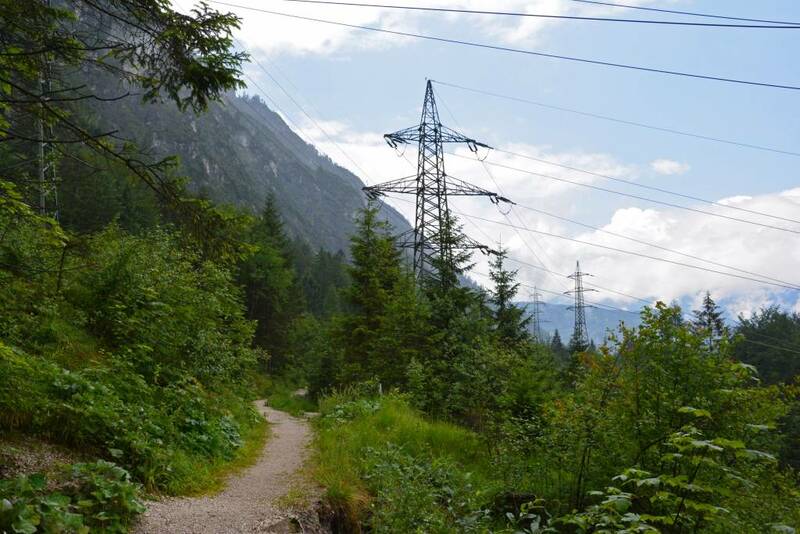 The power-lines were just a bit of an eye-sore on a small portion of the trail as we closed in on Steeg. 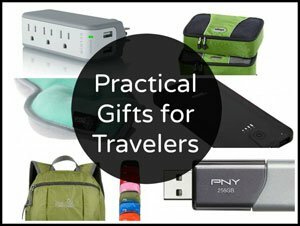 Guess they’ve got to go somewhere! We made it to the town of Steeg just in the nick of time! The rain held off until we walked through the front door of Steegwirt, our much-needed food stop, and once we were inside, it started pouring. 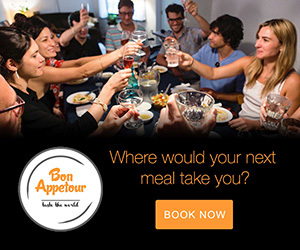 Impeccable timing on our part! Two beers were included with our hiking holiday vouchers, as well as two ‘mountain sausages’. With our stomachs good and full, and with the rain tapering off to a manageable drizzle, we hit the trail once again for the remainder of our journey. 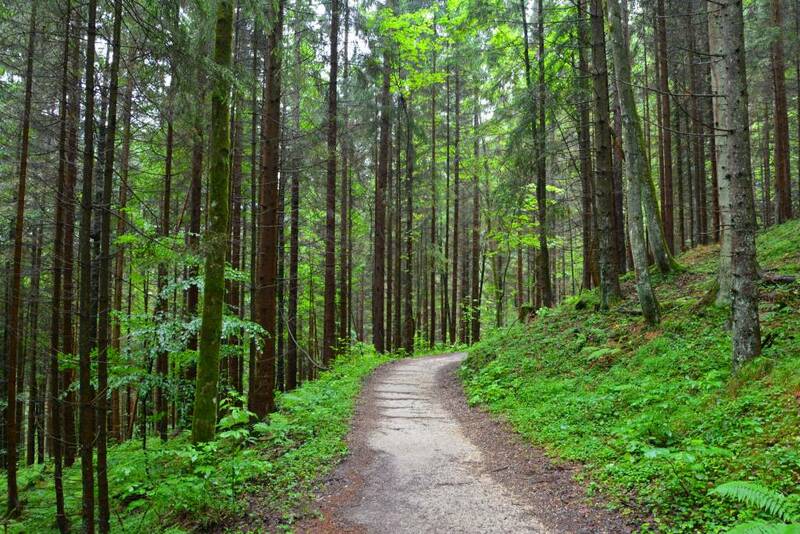 The scenic trail continued to amaze and inspire us! Up to this point, there hadn’t been much up and down, so it was a very manageable hike. 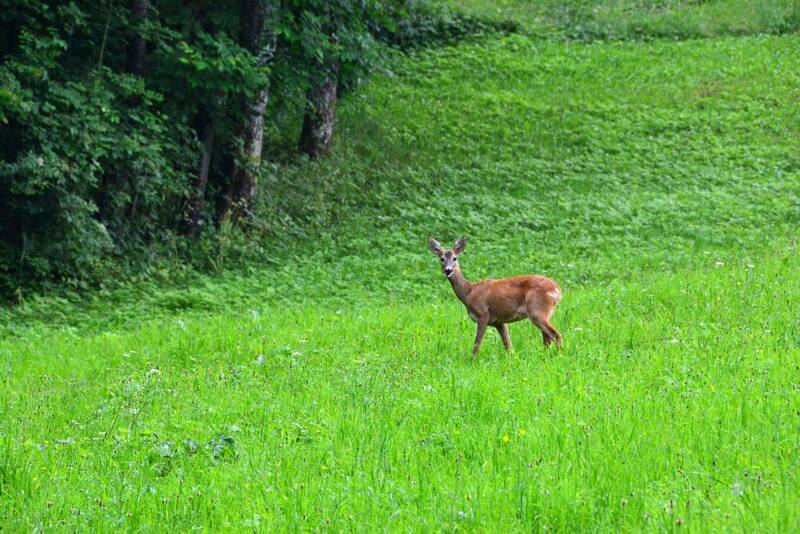 We really loved the endless lush greenery that surrounded us as we made our way toward Hallstatt. 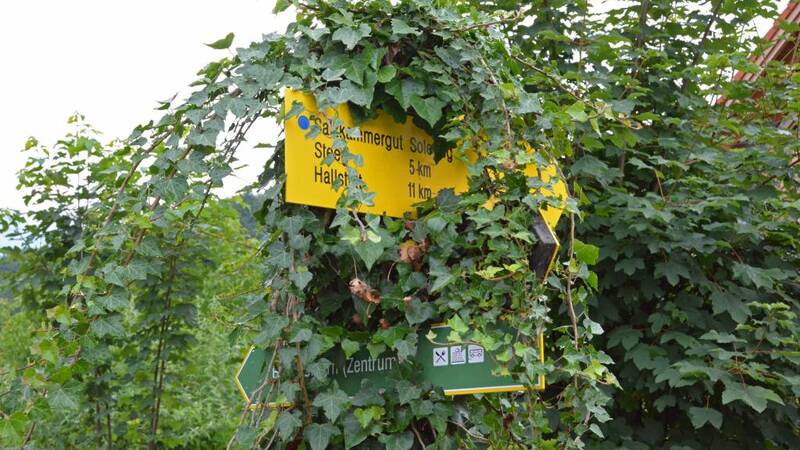 Sometimes the trademark green mountains over yellow background icon would lead us in the right direction and other times the Austrian flag would lead the way! 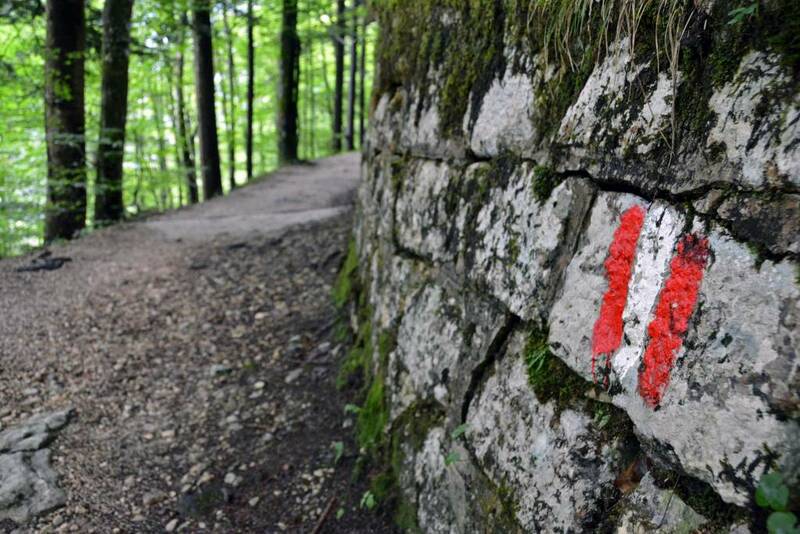 Could’ve been two different trails converging, but we were excited to follow the markings nonetheless. 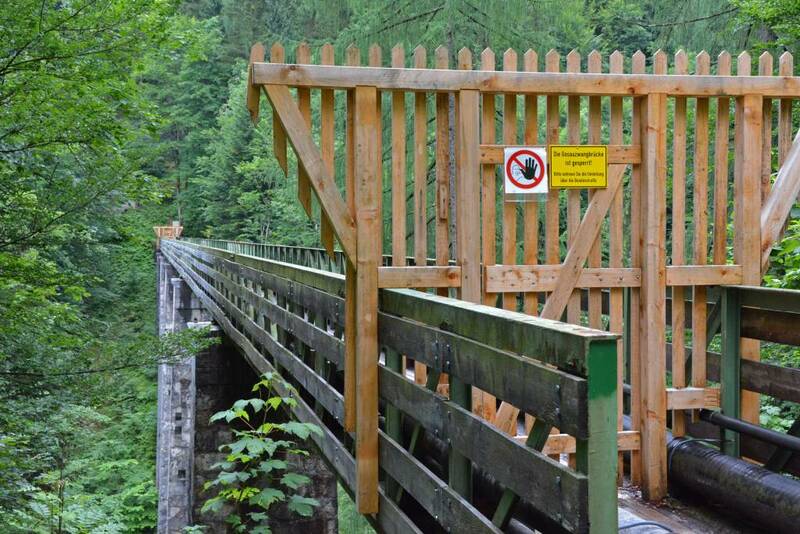 All along our route were warnings that a bridge was out, and after a few hours, we came upon the bridge, which spanned a moderately-busy road far below. 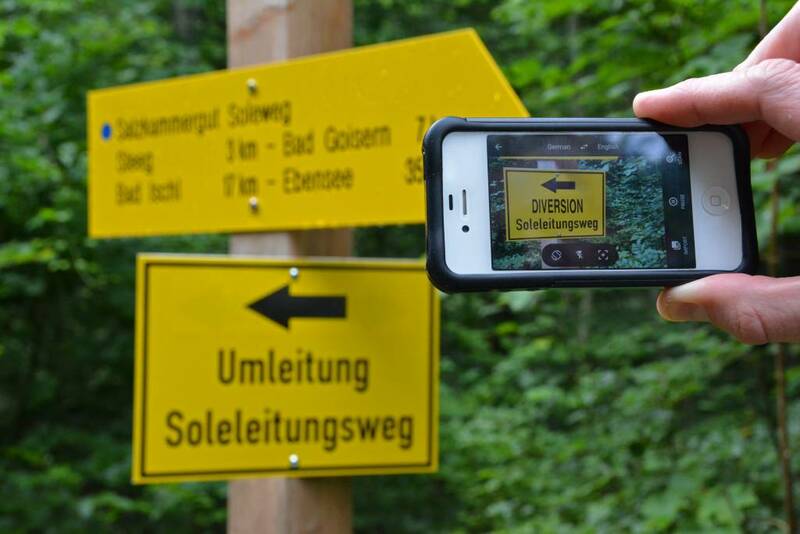 It was obvious what the signs meant without a need for translation, but we busted out our app anyway just to see it in action! 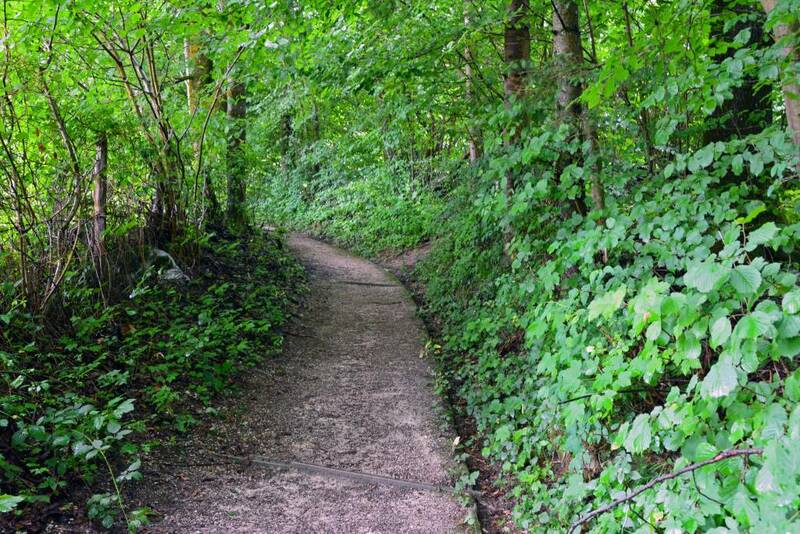 Since it was off-limits for whatever reason, we had to climb down a steep path, walk along the road for a few minutes, then scale the incline back to the trail. The ground had been pretty dry throughout the entire hike until we got near the end. Here we encountered multiple waterfalls running over or onto the path. We got soaked a couple of times, even though we tried running through the gauntlets of water holding up our umbrellas. We soon dried out, however, and it certainly made for an adventure. Clear views over Lake Hallstattersee awaited us on the other side of the waterfalls. …Or did we? 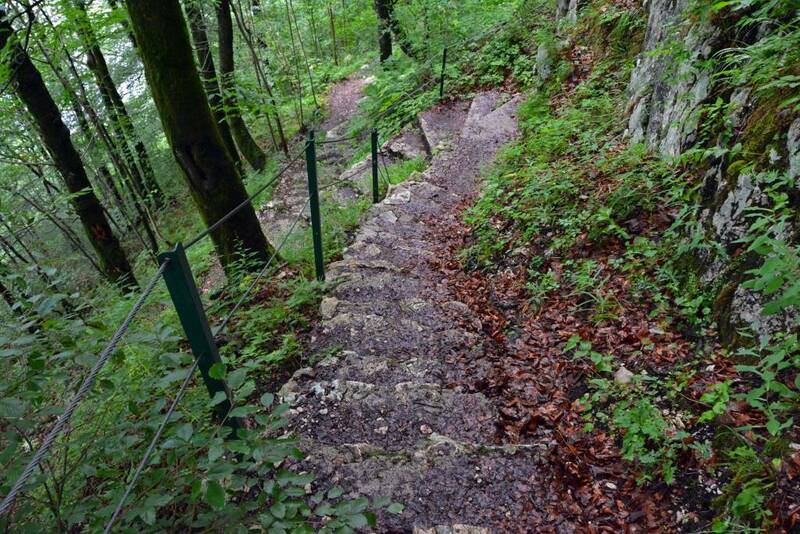 One of the most trying sections of the hike was still ahead of us: the steep climb down stone steps to the town of Hallstatt. 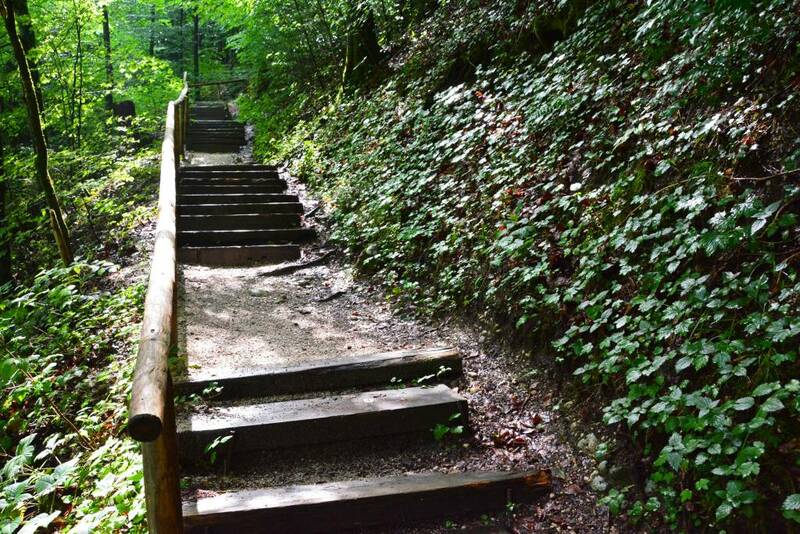 Our legs were a little rubbery and we were tired from the hike, so these stairs were extra difficult! But oh, the views were worth it. 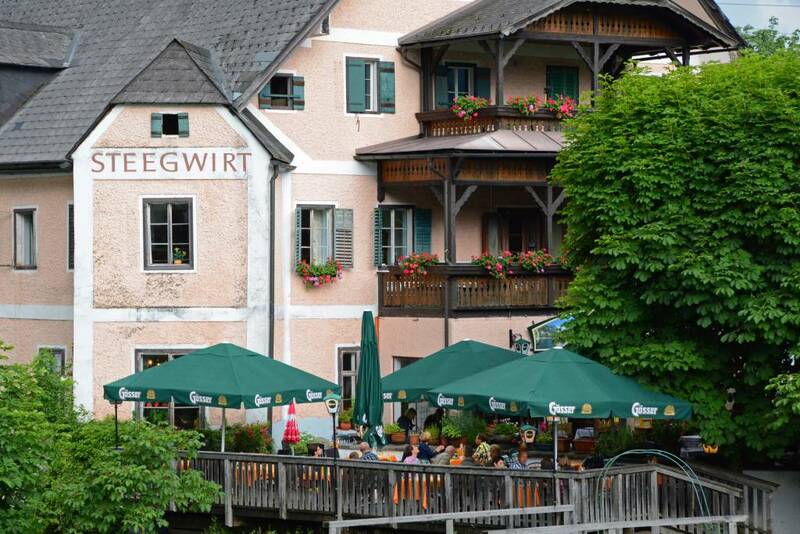 Hallstatt is a gorgeous town, and we quickly forgot about the temporary ache in our muscles. It was a little overcast when we arrived with the threat of heavy rain nipping at our heels, so we hurried to our lodgings for the night. 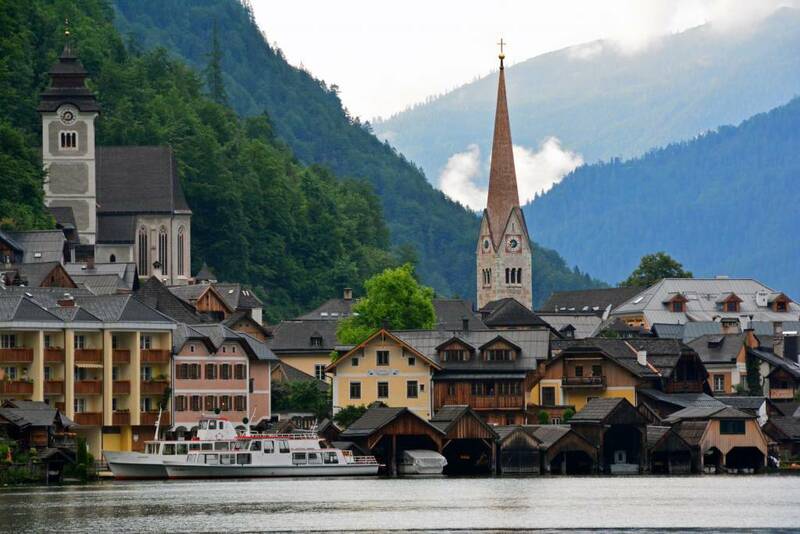 Thankfully we had visited Hallstatt last summer and didn’t need much time to explore the town. All in all, it was a great first day on our hiking holiday! 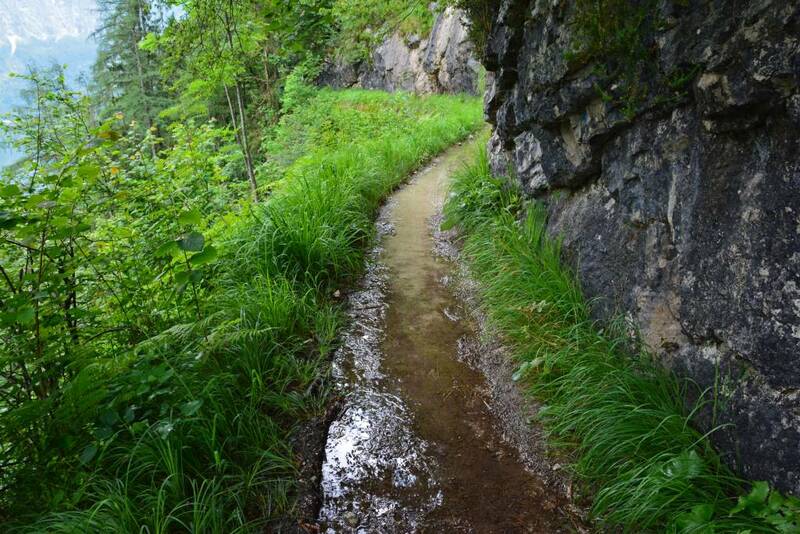 The trail was relatively easy and we were met with gorgeous views the entire way! The next day would prove to be a slightly different story. 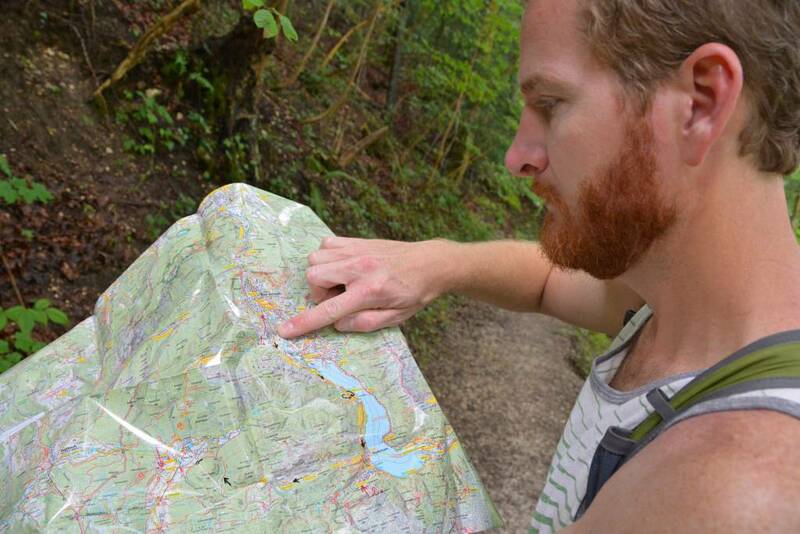 Click HERE for a detailed account of our harrowing hike from Hallstatt to Gosau. 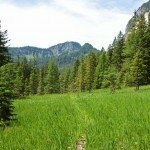 Want to see more of our Austrian hiking holiday? Check out the video below! 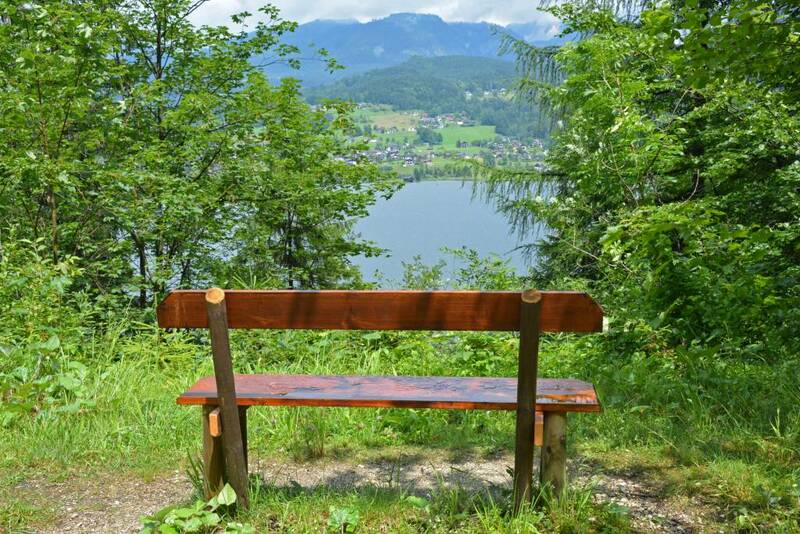 We’d like to thank the Salzkammergut Tourism Board for sponsoring our adventurous 3-day Hiking Holiday. LOVE LOVE LOVE this town! I love all reminders of my trip there Summer of 2007. Thanks for sharing! 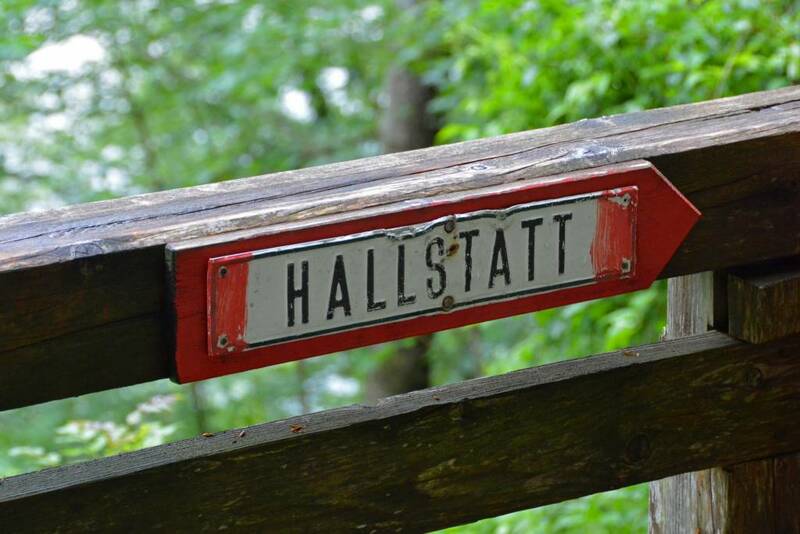 Which town- Hallstatt or Bad Goisern? 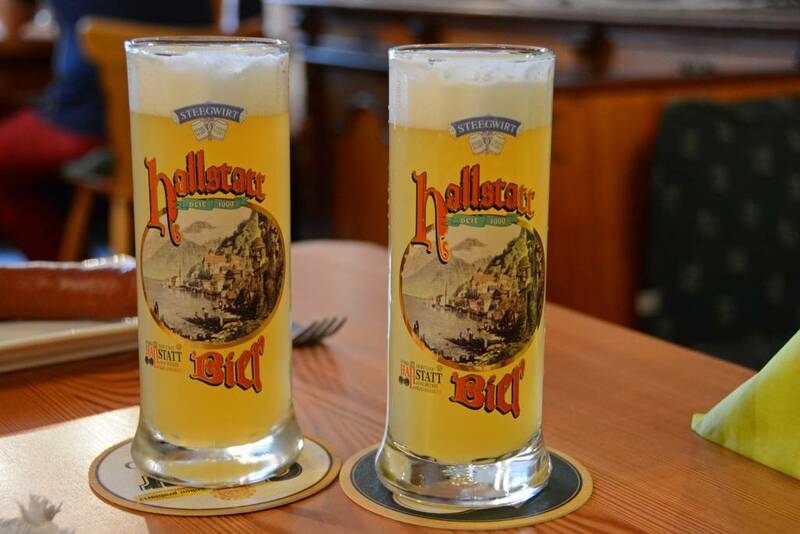 That was our second visit to Hallstatt and only our first to Bad Goisern. 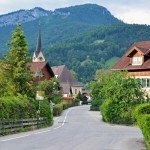 Small Austrian towns are the best! Lovely and not so far 🙂 Have you been to Lativa In Sigulda and city Cesis? I think you would love it. We have not. Thanks for the tip! Hi there! 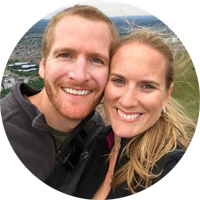 We're Sam and Toccara, travel bloggers who love to seek out new places and experience different cultures. We hope to inspire you to "forget someday" and explore this beautiful world today. 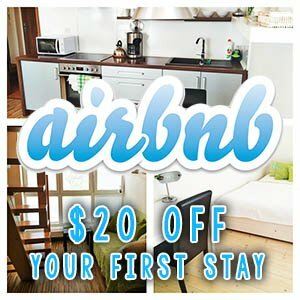 Fully furnished rooms, apartments, and houses often way cheaper than a hotel!